To get the most from The Conspirator it helps to be selectively ignorant of American history. It is useful to have some broad understanding of the brutality and bitterness of the American Civil War, but even better if one has never heard of the conspiracy trial that followed the assassination of Abraham Lincoln. In making this movie, Robert Redford could be fairly confident that for most people nowadays history is terra incognita. The unsubtle message of The Conspirator is that the United States should learn from the mistakes of the past rather than repeat them in times of crisis. The arguments and court room scenes inevitably allude to the judicial farce that saw terrorism suspects interned in Guantanamo Bay with no legal rights. In 1865 it was the murder of the President that led the United States’ government to ignore that most celebrated of all constitutions. In 2001, it was the events of September 11 that set in motion a campaign called “infinite justice”. But as writers such as Arundhati Roy have pointed out, “infinite justice” is the very opposite of justice: another name for vengeance without restraint. Vengeance plays a starring role in The Conspirator, which follows the trial of Mary Surratt, a 42-year-old woman who ran a boarding house where John Wilkes Booth and his friends plotted to avenge the honour of the South. Like Osama Bin Laden, Booth would not live to have his day in court, but so great a crime required an equally spectacular display of justice. Eight people were put on trial before a military tribunal on charges of conspiracy. The most controversial was Mary Surratt, played by Robin Wright in a suitably straight-laced manner. A widow, a practising Catholic, and a proud Southerner, Mary dresses in a funereal black, keeping her hair pulled back tightly from her face. We are never sure whether her puritanical appearance also denotes a fanatic. Even today we don’t know how it was possible for the landlady not to know what was going on in her own house. Then again, we wonder how Rebekah Brooks managed to miss the phone hacking at The News of the World. The task of defending the woman that all America has decided to hate, falls to a young attorney, Frederick Aiken (James McAvoy). A war veteran with a strong sense of loyalty to the Union, Aiken is railroaded into the job by his mentor, Senator Reverdy Johnson (Tom Wilkinson). Guilty or innocent, Johnson argues that Mary Surratt deserves a fair trial. This will be Aiken’s first case, and he takes it on with reluctance. Not only does he share the general revulsion for the conspirators, he is aware this is a game he cannot truly win. Even if he were to prove his client’s innocence it would mark him out as a virtual traitor, earning the undying enmity of the government and the people. He sees his brilliant career going up in flames. History tells us that Aiken persevered with the job, putting up a spirited defence. The man himself was rather less glamorous than the character we meet in the film, but this is a Hollywood movie after all. It is only to be expected that as he meets with one travesty of justice after another, the young lawyer will find himself at odds with the court, the politicians, the public, and even his fiancée. He wages the archetypal one-man crusade for an impossible cause, taking us with him all the way. Did he succeed? It’s easy enough to find out, but if you don’t know, and you value the suspense factor, I’m not about to tell. For an actor who played his share of frivolous, heart-throb roles, Robert Redford has rarely cracked a smile in the director’s chair. His first effort was the maudlin Ordinary People, which won the Oscar for Best Film in 1980. His film before last was Lions for Lambs (2007), a wordy examination of America’s involvement in Afghanistan, that left audiences feeling they had just attended a lecture. Nevertheless, Redford’s movies can never be dismissed. He has a commanding sense of cinematic style, and understands the centrality of dialogue. He is obviously respected by his peers because he always manages to attract an impressive cast. 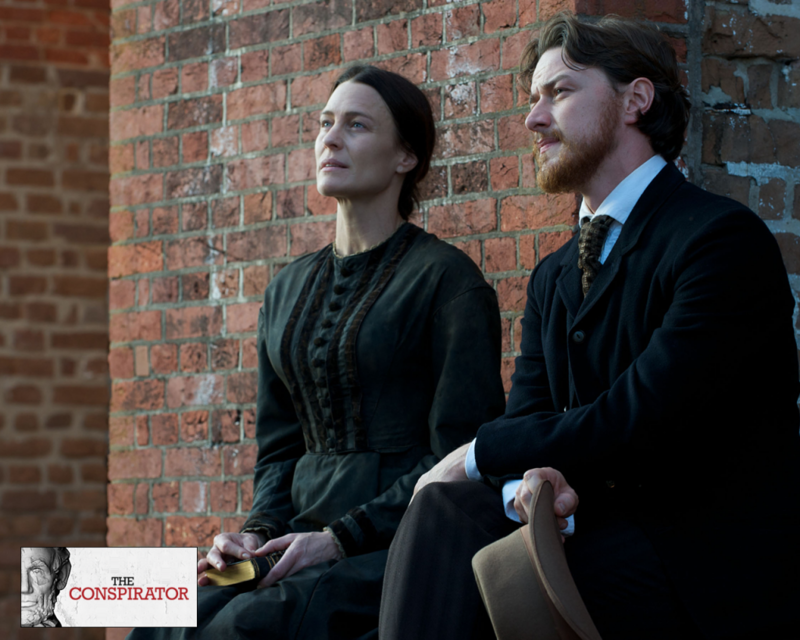 The Conspirator not only stars James McAvoy and Robin Wright, it also features Kevin Kline, playing against type as the austere Secretary of War, Ed Stanton; Evan Rachel Wood, as Mary Surratt’s daughther, Anna; and Danny Houston, as the prosecutor. Even though this is a rather glamourised version of Washington DC, circa 1865, with characters given cleaner, sharper edges than they ever possessed in real life, it is impossible not to be drawn into the mounting drama of the trial. Neither can we ignore the depths of hatred that existed between Yankees and Confederates in the aftermath of the Civil War. It prefigures a vein of extremism that still runs deep in American politics. In a society in which “liberal” is considered a term of abuse, Redford invites us to peer into the chasm that separates the moral and political values of a dis-United States.